LendingClub is one of the most flexible lenders on the market. The company offers an online application process that can be finished in minutes, funding issued within a few days, and manageable, pre-agreed monthly payment schedules. Lending Club provides nearly immediate credit lines to businesses for use in covering a variety of expense types. Once approved, users will be notified of how much credit they are entitled to, and enjoy predictability with fixed, low monthly payments. Lending Club prides itself on being a transparent organization, willing to share information about their company, and give straight answers to all inquiries. Whether users want more information about the company and its management team, the borrowing and investing process, news and updates, or help with specific issues, Lending Club will happily provide the information you are looking for. Lending Club is the world’s largest online credit marketplace, facilitating personal loans, business loans, and financing for elective medical procedures. Borrowers access lower interest rate loans through a fast and easy online or mobile interface. Investors provide the capital to fund the loans in exchange for earning interest. The company operates completely online with no branch infrastructure, and uses technology to lower cost and deliver a superior experience. Cost savings are passed on to borrowers in the form of lower rates and investors in the form of attractive returns. They are transforming the banking system into a frictionless, transparent, and highly efficient online marketplace, helping people achieve their financial goals. To apply for a Lending Club loan, you must be in business at least 12 months under the current ownership with at least $50K in annual revenues. If your business is registered in Idaho or Iowa, you cannot currently apply for a business loan from Lending Club. The safety of all applications is secured by TRUSTe Certified Privacy and DigiCert, dual-layer protection for all of the information you provide online. 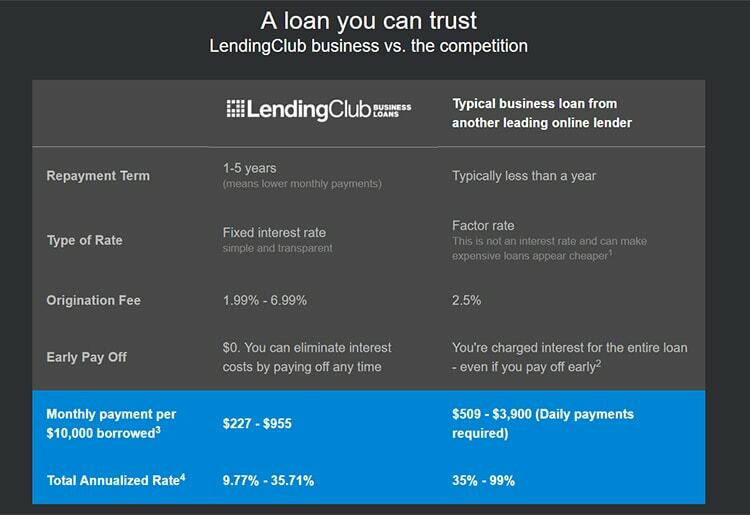 What’s Unique About Lending Club? They understand that your business is your lifeblood, recognizing how important access to funds are for a small business. They believe in full transparency, transforming banking to make it more efficient and consumer friendly. Additionally, they operate completely online with no branch infrastructure and uses technology to lower costs and provide exceptional customer service. With Lending Club, customers will never be charged for hidden fees or subjected to any prepayment penalties. Customers will have access to a dedicated client advisor who will guide users through the process and will always be a phone call away. They are also America's largest online credit marketplace with over $20 billion in funds issued. 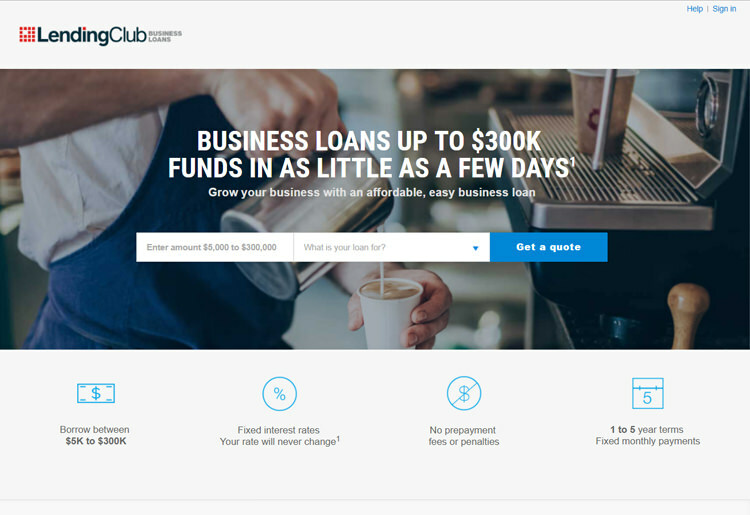 With Lending Club, customers get the financial strength and stability of a publicly traded financial institution (NYSE: LC) but the dedication and attention of a local business. 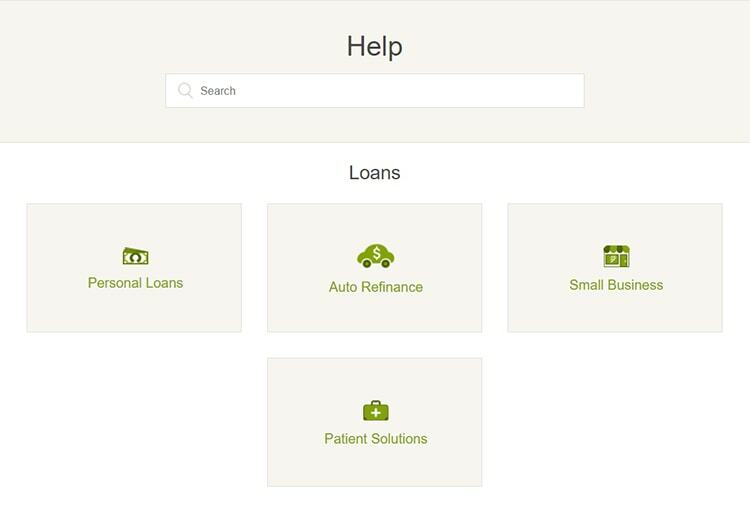 When repaying a business loan from Lending Club, users have a number of options, but the monthly payments are always fixed. Requestors can select any length between 12 months and 5 years. There are no prepayment penalties either - you can reduce your interest payments by clearing the debt sooner. Interest rates start at 7.77% with up to 0.99% origination fee; and maxes out at 25.9% with up to 6.99% origination fee. You have a 30-day grace period for late payments. Lending Club can be reached through a number of channels, whether you want to interact directly via social media, e-mail or phone support. Users can also grab a lot of their answers from the knowledgebase on their website, stocked with an indexed FAQ section and popular topics list. There’s a blog as well. We contacted Lending Club via Twitter and e-mail to get some more information for this review – all responses were prompt and friendly, we had our questions answered the first time. Lending Club is a highly praised marketplace lending company, with a long history of success and a vast amount of loans paid out. 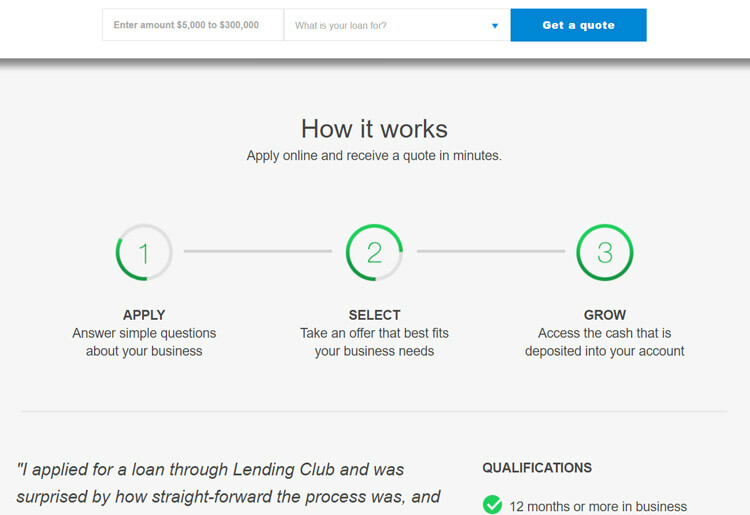 With online application in minutes, funding issued within a few days, and manageable, pre-agreed monthly payments – Lending Club offers a customer-friendly alternative to banks and traditional lending. The A+ BBB accredited business provides up to $300,000 in funding, but will only accept loan requests over $5,000. Lending Club is the pioneer behind online marketplace lending. Offering an entirely different financial model to traditional loan providers, they serve as the middle-man behind investors looking to earn interest on their money and customers looking for more accessible loans. As a fully online service with no physical branches, Lending Club prioritizes cost-saving above profit-making. Founded in 2006 in San Francisco, this provider has released more than $20bn in loans and employs more than 800 people.